A great deal of care should be taken when deciding how you want your figures grouped. Do a few thumb-nail compositions, so that you won't have to tire your family out by shifting them about too much. You might invite them to offer suggestions too. After all if they are interested, it will help them to concentrate on keeping still. After you've blocked out the figures, got the main lines of the pose, etc., if one of them is rather young, as in my picture for instance, and he gets tired, let him go, and ask the others to keep their poses. Then you can persuade the little one to pose again later. However, try not to finish them one at a time, but keep the whole group going all together until you have completely finished. This drawing needs two or three sittings at least. 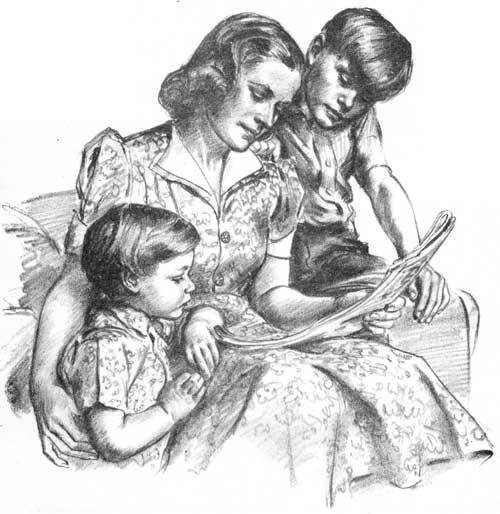 In the picture opposite, mother really did read a story to the children, but even then I had to ask them to remember how they were sitting and give them a rest every 15 minutes or so. Naturally they wanted to. rush over and see how it was going, but I managed to restrain them, by taking my sketch over to them.